The Fairmount Park Neighborhood Association took steps to achieve a long-held goal with the installation of the first of what we hope will be many identification poles at the entrances to our neighborhood earlier this month. 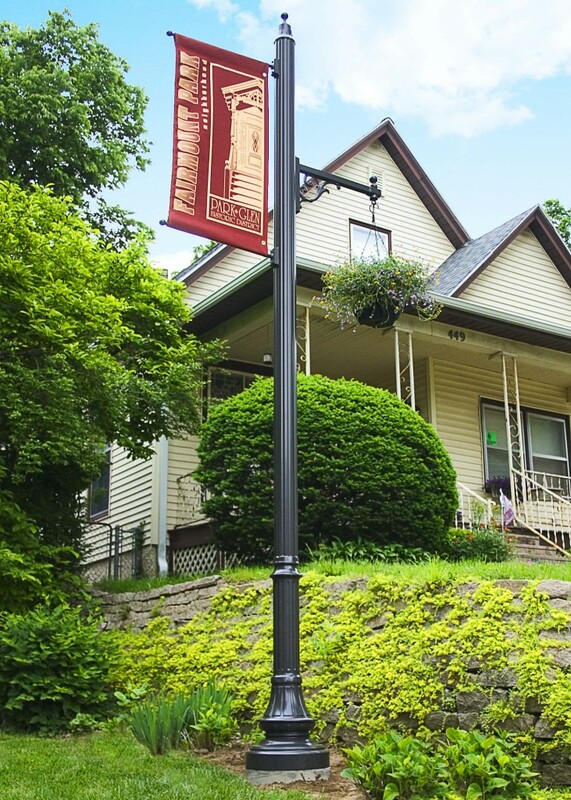 These 14 ft. tall aluminum poles display custom designed banners and professionally planted flower baskets intended to call attention to the historic district in which they are located. The banners, designed by graphic artist and Neighborhood Association President Kyle Muschall, proclaim that this is the Fairmount Park neighborhood and the Park/Glen Historic District. The flower baskets were planted by Sherbondy’s Garden Center. The initial goal of this project was to visually unite our widespread neighborhood. We realized that it would be a costly venture and has conservatively moved forward with various fund raising projects, such as garage sales, home tours, donations from interested individuals, and the dues paid by its many members. Grants were obtained from the Pottawattamie County Community Foundation (PCCF) and the Creating the Ultimate Residential Beautification group (CURB) administered by Keep Council Bluffs Beautiful. Working together, the first phase of this ambitious program was achieved this month, but phase two will continue as more of these beautiful installations are slated to begin later this year. On June 28th beginning at 6:30 p.m., the neighborhood association will hold a pot luck party to thank the people who helped make this project possible, including our talented volunteers who actually did the installation work. It will be held at 445 Glen Ave., the site of one of the completed poles, and is open to the public.